Fencing was one of the first sports introduced to wheelchair users, as a form of rehabilitation, by Sir Ludwig Guttmann at Stoke Mandeville Hospital in the 1950’s. It was part of the first official Paralympic Games in Rome 1960, and today is a thriving national and international sport with over 25 competing nations. 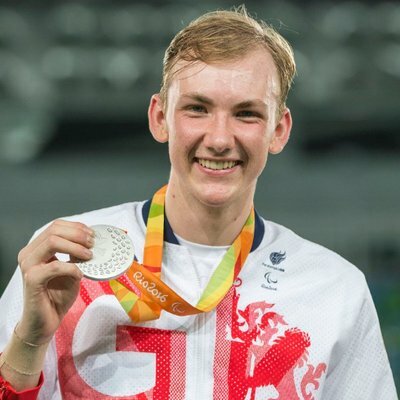 Recent major fencing championships, includes the 2016 Rio Paralympics where Piers Gilliver (pictured below) won silver. If you missed the action and wish to relive the excitment you can view the video stream here. Unlike able-bodied fencing, wheelchair fencing is static - the fencers are clamped to the piste using a metal frame. Apart from this, the sport is largely similar to its able-bodied counterpart featuring the same three weapons - the foil, the epee and the sabre. There is more information on the British Disability Fencing website about classifications and what wheelchair fencing is like. If you do want to find a club near you please contact us, there are clubs and coaches in Scotland who have qualifications in wheelchair fencing so if you are interested we can help you find a club.